Buckingham Browne & Nichols | © 2018 StudentBridge, Inc. The Brick Building serves as the homeroom location for grades 5 and 6, and the library for grades 2-6. You can also find the Community Room on the second floor, and the Lower School Director's Office on the first floor. It was built in 1921 to accommodate the expanded Buckingham School for girls. The Gymnasium is the largest indoor gathering area on the Lower School campus. During the regular school day it is used for physical education, and concerts, musicals, and closing ceremonies are also held in this space. The New Wing is a two-wing facility which houses homeroom classrooms for grades 2-4. The Markham House, known for its distinctive red exterior, is the original building in which the Buckingham School for Girls started in 1889. It is now home to the Arts, Math, and World Languages studies.Whether it's building sets for the upcoming musical, belting out traditional Puerto Rican pop music, or solving logic puzzles, there is always something fun and interesting happening in this building. The Kelsey House serves as headquarters for the Lower School's 60 faculty members. Morrison House is home base for the Lower School Admission Office. Your introduction to the BB&N Lower School journey (which, of course, eventually leads to the Middle School and then Upper School journey) starts here! Grades 2 through 6 students enjoy two expansive play structures with slides, monkey bars, bridges, and much more! The students get ample outdoor time throughout the day to burn energy, explore their creativity, and build advanced social skills. Bridgman House serves three different functions. The first floor serves as the After School classroom. On the second floor are the Teacher Training Institute and Lower School Counselor's Office. Finally, BB&N's (All-School) Office of Communications is located on the third floor. 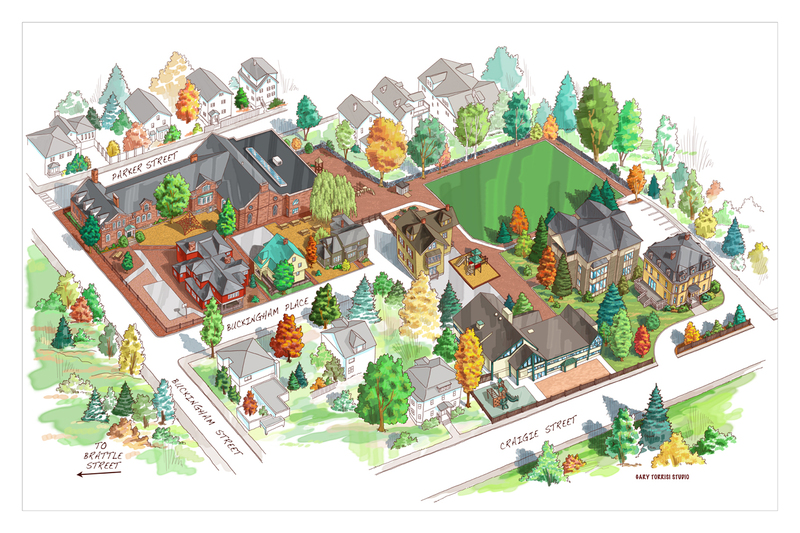 The Morse Building is where it all begins at the BB&N Lower School. It is home to Beginners, Kindergarten, and Grade 1 students' classrooms, library, and music room. The Lower School Nurse's Office and Lower School Assistant Director's Office are also located in this building. Kindergarteners and Grade 1 students benefit from their own playground, giving them the opportunity to build close relationships with one another and their teachers. Adjacent to the playground is the beloved Outdoor Classroom, which was created in 2014. Beginners enjoy their time outside on their own dedicated playground. Common activities include playing basketball, digging in the sandbox, and playing group games with friends. The Lehner Center, opened in 2001, is home to science, technology, and music classrooms. A beautiful meeting room, the Pokross Room, is located on the third floor. This beautiful building on Craigie Street serves as the Head of School's residence and occasionally is the site of open houses or garden parties for the BB&N community.